This is a handly USB to serial (UART) converter module. 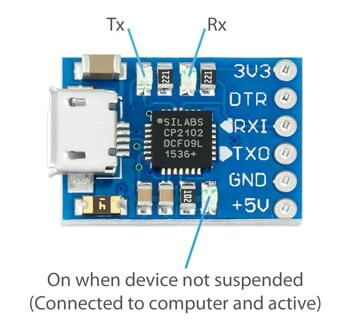 You can use it to communicate with ESP8266 modules, ATmega328 ICs, Arduino's, sensors, and other devices that use serial (UART) to communicate. A great feature of these modules is that Windows machines will not require you to do anything to install any drivers. Just plug this module into your computer using a micro usb cable and start using it. Mac users will benefit from the same ease of use, but if necessary we have provided download links in the resources section below for Windows, Mac, and Linux drivers. We have tested these modules with our ESP8266 modules, Pro Mini boards, and HC-06 Bluetooth modules and these modules work great with them. Nice part at a great price. Very quick shipping. Works like a charm. Great price. Linux drivers are dependent on kernel. If you are having trouble compiling the software you might need to browse to silabs like I did to download correct version. There are two 3.x.x and 2.6.x.